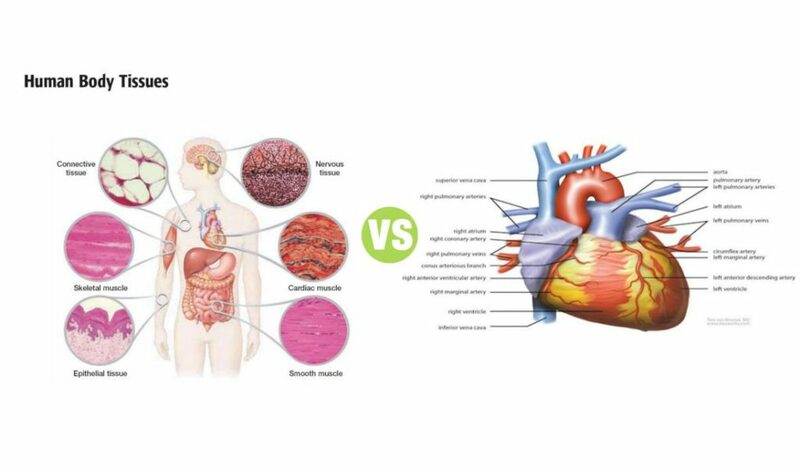 Summary: Difference Between Tissue and Organ is that Tissue is defined as the group of cells having similar function. While Muscle mass or muscle tissue is made up of a large number of individual muscle cells or myocytes. An organ is defined as the structure that is formed by two or more primary types of tissues, which execute the functions of the organ. Some organs are composed of all the four types of primary tissues. The organs are of two types, namely tubular or hollow organs and compact or parenchymal organs. Some of the organs in the body are brain, heart, lungs, stomach, intestine, liver, gallbladder, pancreas, kidneys, endocrine glands, etc. The organ system is defined as group of organs that work together to carry out specific functions of the body. Each system performs a specific function. Digestive system is concerned with digestion of food particles. Excretory system eliminates unwanted substances. Cardiovascular system is responsible for transport of substances between the organs. Respiratory system is concerned with the supply of oxygen and removal of carbon dioxide. Reproductive system is involved in the reproduction of species.